Personalized 6x7 vintage floral seamless wedding save the date square corner magnets are perfect way to announce your romantic union to all those who matter to you. This magnet prominently shows up against any surface and a glance is good enough to send a wave of warmth down the spines of a viewer. 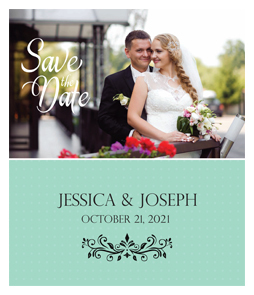 Custom 6x 7 inch vintage floral seamless wedding save the date wedding helps to aptly portray the excitement surrounding your vintage themed wedding.